BY NANCY GAGNET | MIRROR NEWSPAPER — Dino’s Restaurant – a familiar stand-alone building in the corner of Golden Gate Plaza – serves up some of the best chili mac in town, according to one Toledo native who often travels throughout Ohio. “I come here to get some real chili mac,” customer Ray Helminiak told owner Dean Yakumithis. “There are Skyline Chili restaurants all over Southwest Ohio, but there is no comparison. It’s not nearly as delicious as it is here,” he said to the smiling owner. Dean Yakumithis opened Dino’s Restaurant in April 1997 and said his chili mac recipe is a secret. “My grandfather got it from some little old Greek guy,” he said. 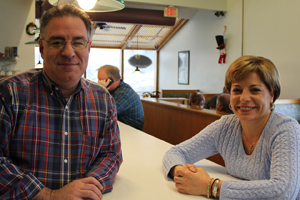 In 1997, Dean and his wife Yanna purchased the Maumee restaurant, which had been Don’s Drive In since the mid-1950s. They ran it until a fire in 2002 forced them to shut the business down for seven months while they rebuilt. “The only part of the restaurant that wasn’t damaged was the atrium and basement,” Dean explained. While the shape of the restaurant remained the same, everything was rebuilt and more counter space was added. Today, bright walls of windows surround the restaurant and the owners pride themselves on providing caring service to all who sit down for a meal. With a priority on cleanliness, the restaurant displays its health inspection reports in the entrance. “We want to make our customers happy and content. I always say that if they don’t eat, we don’t eat, and we want the experience to be as pleasant as possible,” Dean said. In addition to chili mac, the restaurant serves daily dinner specials, homemade soups, appetizers and sandwiches including classics such as the BLT, patty melt, Rueben and Philly steak. Breakfast is served all day, and all kids’ meals are under $5.00. Dean is a third-generation restaurant owner. His father and grandfather own and operate Michael’s Bar and Grill in downtown Toledo. “I don’t even remember not being in the restaurant business,” he said. Dean and Yanna rely on eight employees to make the place run smoothly. Dino’s Restaurant is located at 129 Golden Gate Plaza, at Gibbs Street and the Anthony Wayne Trail, in Maumee. Business hours are Monday through Friday from 7:00 a.m. until 9:00 p.m., Saturday and Sunday 7:00 a.m. until 3:00 p.m.